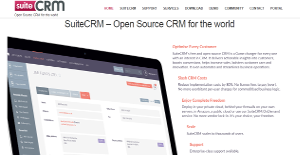 SuiteCRM is a free and open source customer relationship management (CRM) solution that gives users highly actionable insights on which to base critical business decisions, actions, and strategies. SuiteCRM is designed to greatly improve business sales by enabling companies to bolster conversions, turn leads into customers, and drive innovation in product development and customer care. With SuiteCRM, businesses are able to engage with their potential clients and existing customers at every point of contact and optimize all opportunities that come along. As the software is offered as a free and open source platform, users are able to reduce their CRM-related expenses by as much as 80%. You also have total control over deployment. You can choose to have SuiteCRM deployed in your private cloud or directly on your servers behind your firewalls. Amazon? Sure. Public cloud? You can do that too. SuiteCRM gives businesses an award-winning CRM platform that is free and open source and ranks among the most popular CRM options available out there including Salesforce, Oracle, SAP and Microsoft Dynamics to name a few. Function-wise, SuiteCRM is equipped with the tools and functionalities to serve companies on an enterprise-level. Ready right off the bat, you can easily tweak SuiteCRM’s configurations to suit your business needs and requirements. With SuiteCRM, users can build business process models and create flexible, automated actions that can be activated to operate at any time. Users can also create sales pipeline models and design template customer quotes, regulate and control pricing strategies, maintain contract renewals and monitor the progress of leads. SuiteCRM offers business-unique self-service portals that enable users to deliver high quality and interactive support to their customers. Once a support request has been made, notifications are instantly delivered to service teams customers are instantly notified when the issues have been addressed and resolved. SuiteCRM is free to download and use. That said, there is a fee that comes with customization options, Free support can be found in the community forum, whereas dedicated support services are available to small and midsize clients and unique solutions with dedicated account managers are available to large enterprise clients. What Problems Will SuiteCRM Solve? Scenario 1: Customer Management – everyone business knows that effective management of customers results in increased revenue and higher rates of customer retention. SuiteCRM allows you to track your customer journey throughout, from the initial inquiry stage through to purchase. You can also automate various reminders in order to keep in contact with the customer or to follow up at various stages of the buying process. It also has a built-in customer service module. Scenario 2: External Marketing Applications – SuiteCRM has an inbuilt marketing function which will assist with all your marketing efforts. It has a its own ROI calculator, as well as a sophisticated email campaign module built into the system, allowing you to design, deploy and track your campaigns all from within your CRM application. It also has the capability of capturing information directly from submitted website forms and placing this within the CRM to help you manage your sales leads more effectively. Scenario 3: Managing your Companies Finances – SuiteCRM has an all encompassing finance module which helps keep track of all incoming and outgoing invoices. Its assists with the management of your companies financial wellbeing. SuiteCRM helps you create PDF templates including contract documents, invoices and quotes, all of which can be stored with each separate customer account ensuing full viability of the financial status of any account in an instant. Each enterprise has its own characteristics, and can call for a special CRM Software solution that will be designed for their company size, type of customers and employees and even individual niche they cater to. You should not count on finding an ideal app that is going to be suitable for each business regardless of their history is. It may be a good idea to read a few SuiteCRM reviews first and even then you should pay attention to what the service is intended to do for your business and your workers. Do you need a simple and intuitive app with only essential features? Will you really use the advanced functionalities required by pros and large enterprises? Are there any particular features that are especially practical for the industry you work in? If you ask yourself these questions it is going to be much easier to get a solid software that will match your budget. How Much Does SuiteCRM Cost? We realize that when you make a decision to buy CRM Software it’s important not only to see how experts evaluate it in their reviews, but also to find out if the real people and companies that buy it are actually satisfied with the product. That’s why we’ve created our behavior-based Customer Satisfaction Algorithm™ that gathers customer reviews, comments and SuiteCRM reviews across a wide range of social media sites. The data is then presented in an easy to digest form showing how many people had positive and negative experience with SuiteCRM. With that information at hand you should be equipped to make an informed buying decision that you won’t regret. What are SuiteCRM pricing details? What integrations are available for SuiteCRM?